SPCR • View topic - re-using an older case with a new CPU cooler? re-using an older case with a new CPU cooler? Post subject: re-using an older case with a new CPU cooler? 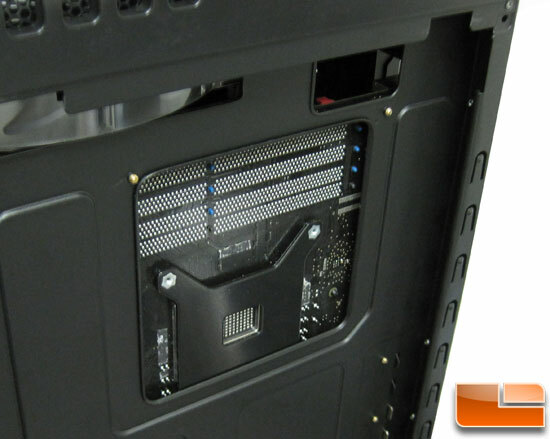 Are there any modern CPU coolers that would fit in an older PC case (circa 2007) that doesn't have a cutout in the MB tray? Post subject: Re: re-using an older case with a new CPU cooler? The CPU cutout is only there to make it easier to install/remove the cooler. The backplate doesn't actually stick out all the way through the motherboard tray. I was using a Noctua NH-U12P, and later a Thermalright HR-02, in an Antec P182 (no cutout) just fine. The biggest thing is that you have to take the motherboard out for installation. If you're not worried about that, then you're good to go. You can measure the motherboard to the inside lip of the case, and as long as the cooler physically fits, there's no reason it wont work. The whole motherboard cutout thing baffles me, anyway. It's much more convenient for me to install the CPU cooler and RAM on my work table than it is to do it inside the case. I think the only people that truly benefit from it are reviewers and perhaps people that want to retrofit a cooler later on. Lots of AMD ones, about none for Intel architectures (No Country for Old Pushpins). Better to have it and not need it, than to need it and not have it, especially when it costs so little to do, and has bugger all impact on the structural integrity of the case. I had every intention of using one of my older PC cases for my last build. But after mounting the cooler (Hyper 212 EVO) I looked at it and thought that there might be clearance issues with the cooler backplate and the MB tray not having the cutout. I thought it looked as if the backplate would come in contact with the MB tray or even press against it, and I didn't want to risk that, so I ended up purchsing a new case with a MB cutout to use for the build instead. Does the backplate on the Hyper 212 EVO protrude any more than average? I'm pretty happy with that cooler (I swapped the fan) and might like to use one for my next build if it will fit in my old case. To see if the cooler backplate is too high I'd try sitting the board on the tray and seeing it the screw holes touch the standoffs. But I doubt the cooler backplate would touch let alone push on the tray, someone correct me if I'm wrong but it seems to me the standard MB standoff is 9mm (3/8"), at least mine is and it's a pretty old case. For comparison that's 7 optical discs stacked on top of each other, any cooler that needed that much of a backplate would probably snap your motherboard regardless. Nope. I put a 212 EVO in my dad's Antec Solo (no cutout) if that reassures you in any way. Measure the height of the motherboard standoffs and the height of the 212 EVO's backplate if you want to be absolutely certain. Thanks for the info everyone. Seems like it should work. Pulled the board out of the current case. Just to be sure, I installed this correctly, yes? I placed it on a flat surface on (inverted) standoffs to try to get an idea of how much clearance there is below the backplate. Not much clearance. This is using my tallest standoffs. The backplate looks like correctly installed: btw, you have to use the standard standoffs supplied with the case, otherwise the I/O shield couldn't align with the case back cut-out for I/O connectors. I'm not even sure which length the orignal standoffs are cause the case is so old. I realize about the issue with the I/O plate alignment and also expansion slots alignment. However, if I'm going to put this board in a case with no cutout, I may just have to accept misalignment otherwise it will not work. I'm not going to use any expansion cards, so that isn't a problem. I could even not use the I/O plate at all if it came to that. At this point I'm more concerned the top of the CPU cooler might not clear the side panel. I'll need to test fit it in the case next. Those standoffs look pretty standard, maybe even a bit shorter than normal. I don't think many, if any, cases come with shorter standoffs. Some high-end cases like the TJ11 use even taller standoffs. I still think you'll be absolutely fine, and if Coolermaster had made the backplate lower profile, I'd be questioning it's structural integrity, and asking why they hadn't used more of the available space. Why not? There's no risk of electrical shorts (the Hyper 212's backplate is electrically insulated on both sides, and even if it weren't, most mobos have no exposed traces/components where backplates make contact) so as long as you can screw the mobo to the tray, what's the problem? And actually, a little contact would be beneficial, as the tray would become a direct support for the CPU cooler, reducing the risks of the cooler tearing off should your case take a jolt during a move and allowing higher-pressure mounts by preventing the mobo from concaving when the cooler's tightened down. Regardless, altering standoff height will almost surely make for a great deal of annoyance. Installing expansion cards will be a royal pain and I/O shields are your friend, blocking EMI and preventing you from pushing conductive things into your computer. I've done that several times while blindly groping around the cable tangle sprouting from the back of an unshielded rear panel, and it's pure luck that nothing got shorted. EDIT: Oops. You're worried about contacting the side-panel, right? I'm confident that any case with more than 7.25" between the mobo tray and the side panel should work fine. By my quick-and-dirty measure, my Hyper 212 needs ~7" clearance from tray to heatpipe tips, and a 0.25" safety margin should comfortably accommodate differences in your standoff, CPU, CPU socket, and mobo dimensions. Thanks. I installed it today. The standoffs in that case turned out to be exactly the same ones that I used for the photos, so no problems there. The I/O shield and PCI slot alignment is perfect. And there didn't seem to be any contact with the MB tray as I was installing it, and there is plenty of clearance (>1cm) between the top of the CPU cooler heatpipe tips and the side panel, so no problems there either. Irrelevant, I was concerned about both contact with MB tray and with the side panel. What you are saying about the contact with the MB tray not being an issue and perhaps even being beneficial makes sense. I just never thought about it that way and assumed it would be bad.